The #TofinoEats Chef Series has been happening for over a year now. In that time, we have been fortunate enough to pull some of the nation’s most talented chefs to our tiny town of Tofino to create memorable meals alongside our very own Chef Paul Moran. His network of next-level chefs is impressive, and the results have been tasty and inspiring. Here are a quick top five moments from the past year, as curated by Moran. The very first #TofinoEats Chef Series invited Ned Bell to 1909 Kitchen to celebrate the release of his incredible cookbook, Lure. 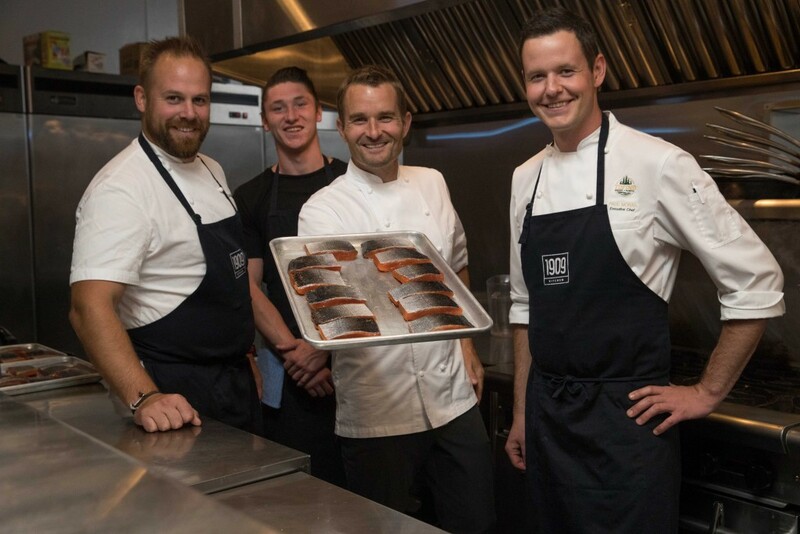 Bell, now executive chef and ambassador with Ocean Wise—the Vancouver Aquarium’s sustainable seafood program—showed up to great fanfare and created a delectable meal alongside Moran. Over a year later, the first event in this series still stands out. After famous Vancouver sushi savant Chef Hilary Nguy partnered with Moran last February on his Omakase dinner (literally translated to “I’ll leave it up to you”), it was clear Tofino wanted him back. The friendly and ultra-talented chef shares the same love for Tofino that we do, and Tofino loves his sushi. Chef Hilary returned a year later, and Tofino is now more than willing to “leave it up” to this master of his craft. Let’s make it a hat trick? Chef Moran was the youngest-ever apprentice to learn under famed Canadian chef David Hawksworth, and when the master made it to Tofino to check out 1909 Kitchen, the whole town was excited. Moran also invited Nightingale executive chef Phil Scarphone. Watching the three of them work in 1909’s open kitchen was a treat for the passionate foodies who made sure not to miss this landmark event. Year at the Vancouver Magazine restaurant awards and has won both the Gold Medal Plates tittle and Iron Chef Canada. Boulevard also took home gold in the Best Upscale and Best Seafood categories. Chen held the executive chef position at the prestigious Beverly Hills Hotel, and has worked under renowned chefs and culinary pioneers such as Robert Sulatycky and Bruno Marti.